Archaeologists working in the Shangchen region of China have uncovered dozens of stone tools, the oldest of which date back 2.1 million years, making them the earliest known evidence of a human presence outside of Africa. 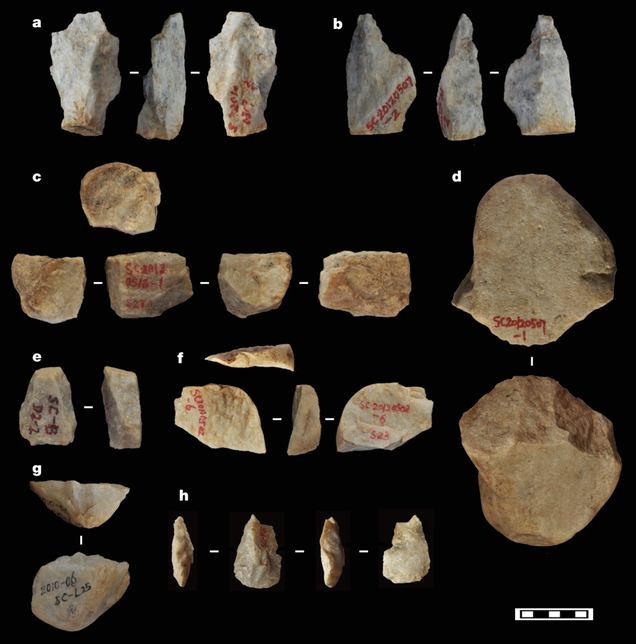 Ancient humans, likely a form of Homo erectus, occupied what is now the Shangchen region of China some 2.1 million years ago, according to new research published today in Nature. This area is about 400 miles (660 km) west of Shanghai, but more importantly, it’s roughly 9,000 miles (14,000 km) east of Africa, the birthplace of hominins. The discovery of 96 stone tools buried within 17 largely continuous layers of sediment, dating to between 1.3 million to 2.1 million years ago, suggests humans made their way from Africa to China longer ago than we thought. Prior to this discovery, the oldest known evidence of hominin activity outside of Africa was uncovered in Dmanisi, Georgia, namely tools and bones of a human species, possibly Homo erectus, dating back 1.85 million years. Other tools and fossils found in China and Java date back to between 1.5 million and 1.7 million years ago. But this new evidence breaks the two-million-year barrier, a first for archaeologists working outside of Africa. The astounding discovery shows that so-called “archaic humans” were romping around Asia some 1.3 million years before our species, Homo sapiens, even existed. A picture of the site. 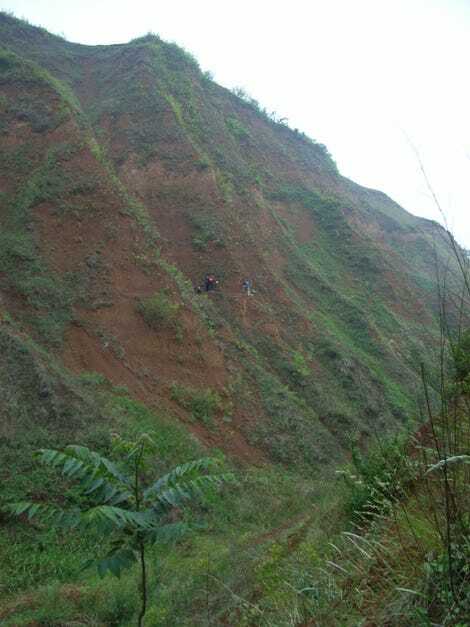 A team led by Zhaoyu Zhu from the Chinese Academy of Sciences in Guangzhou, China, uncovered the artefacts in the Chinese Loess Plateau. The researchers pulled out 82 flaked stone tools and 14 unflaked stones. The tools, which date back to the Early Pleistocene, were basic in their construction but diverse in terms of function, and included cores, flakes, scrapers, points, borers, picks, and hammerstones, the latter of which exhibited signs of use. Further excavations at the site revealed the lower jaw fragment of a deer, and fossils of a bovid, another cloven-hoofed herbivore, among other bone fragments. Importantly, none of the animal fossils exhibited signs of butchery, such as cut marks or deliberate breakage for accessing bone marrow, so direct evidence of animal processing was not found. The artefacts were discovered within 17 sedimentary layers. Eleven of these layers were associated with a wet and warm environment—layers which happened to contain the richest deposits of stone tools (80 to be exact). The other six layers were associated with a colder and drier environment, and they featured far fewer artefacts. Zhu and colleagues say the 17 layers span a long period, around 850,000 years, during which the region was repeatedly, though not necessarily continuously, occupied by humans, and that environmental conditions were likely an important contributor to the success and struggles of these populations. Some of the tools found at the site. As always, it’s important to discuss how the researchers arrived at their dates. In this case, they used a technique known as palaeomagnetic dating, which analyses sediment and loess (wind-blown sand). This dating technique leverages the influence of our planet’s magnetic field when it flips, which it does from time to time, turning the magnetic north pole into the magnetic south, and vice versa. Magnetic minerals buried within sediments and loess register these polarity flips, which scientists can link to a dated reference known as the geomagnetic polarity timescale. In this case, the layers ranged in age from 1.3 million to 2.1 million years ago. Importantly, the minerals within the 17 sedimentary layers, and not the artefacts themselves, were dated, so it’s an example of “indirect” dating. It’s possible, therefore, that these artefacts aren’t as old at the dating suggests, but it’s difficult to explain how these items could otherwise have gotten there (perhaps these tools were deliberately buried, for example). Also, it’s important to point out that no fossil evidence of humans was uncovered at the site, making it impossible for the researchers to link the tools to a specific species of human. The roughly 14,000-kilometre [9,000 miles] trek from eastern Africa to eastern Asia represents a range expansion of dramatic proportions. The dispersal of hominins was probably facilitated by population increases as they moved into new territories and filled empty niches, and could also have been driven by the phenomenon of resource depletion that underlies the high mobility of today’s hunter-gatherers. Yet even with a dispersal rate of only 5–15 kilometres [3–9 miles] per year, a value well inside the daily foraging range of modern hunter-gatherers, the distance between Africa and Asia could have been covered in just 1,000–3,000 years. Kappelman says further archaeological work is required to show the exact speed and route taken by these ancient humans. Katerina Harvati, head of palaeoanthropology at the Senckenberg Center for Human Evolution and Palaeoenvironment, likes the new study, saying the authors did a good job with their fieldwork, dating, and analysis. She said the artefacts are convincing and the use of palaeomagnetic dating was appropriate. But Harvati believes there’s room for improvement, both for the geological study of the site, and in the use of other dating techniques. Harvati says it’s surprising that hominins didn’t expand their geographic range out of Africa earlier, especially after the first appearance of stone tools some three million years ago.